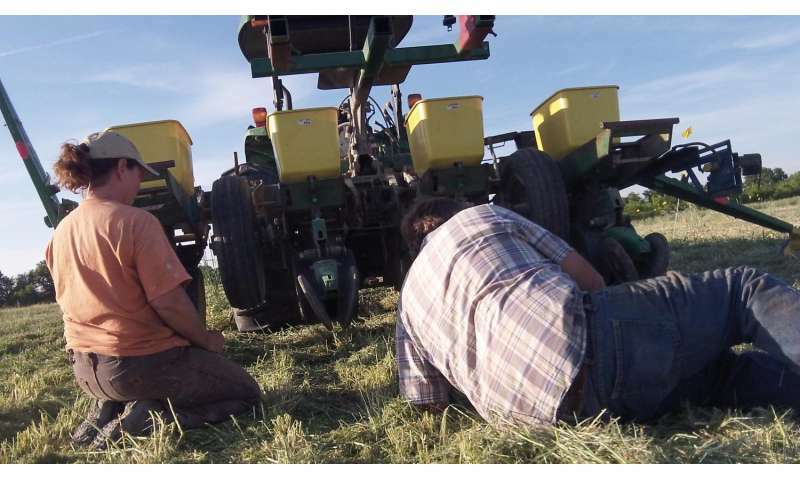 Researchers collect soil samples from a crimped -- or flattened -- cover crop plot. Farmers can use cover crops to choke weeds and retain soil fertility. Credit: Kerry Clark. To grow crops organically, farmers fight weeds with chemical-free weapons. One of the most common is a disk. Farmers rip out weeds and churn them into the soil with these disks. But it takes heavy tractors to do this efficiently, and large tractor tires compress the soil as they roll across the field. The process also depletes soil organic carbon, which plants depend on for nutrients, moisture, and healthy bacteria. And after a field is turned, heavy rains and wind can erode the exposed soil. University of Missouri soil scientist Kerry Clark and a team including researchers from the USDA Agricultural Research Service are working to get the best of both worlds. Can organic growers fight weeds and increase soil health? 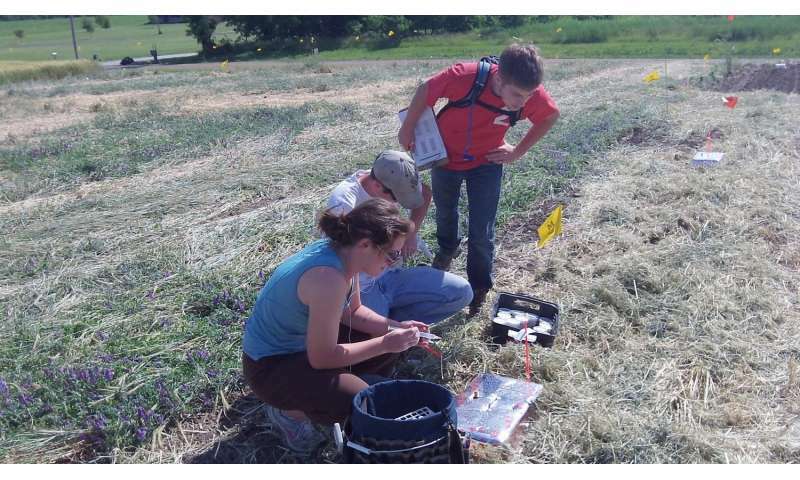 Researchers know cover crops provide part of the answer. Cover crops anchor the soil with their roots. Some even add nutrients to the soil. That would take care of the soil health concern. But the question of weeds remains. Clark and her team experimented with three methods. One method used cover crops instead of disks to suppress weeds. They compared this method to two other organic options: using cover crops but turning them under, and the standard disk use without a cover crop. Matting cover crops is key to the first method. Instead of turning the cover crop under, it is flattened with a roller crimper. This is a long rolling wheel attached to a tractor. The flattened cover crop creates a matted barrier over the soil. Afterwards, researchers plant cash crop seed into the mat, often using disks to cut through it. If the cover crop was healthy and abundant, the mat will be thick enough to choke out weeds. Trying to get correct planting depth in organic no-till, seed to soil contact is one of the biggest challenges in the system. Credit: Amanda Wolfgeher. Here a delicate balance must be found. If the cover crop doesn't grow well, it won't be able to form a weed-suppressing mat or outcompete the weeds. However, if it grows too well, it may compete with the cash crop itself, or leave persistent seeds behind. Over a two-year experiment, the researchers confirmed two principles: there's no silver bullet for producing the perfect crop. And unexpected weather always gets in the way. The experiment was plagued by drought for one year. Despite this, the team also confirmed earlier research that found cover crops require almost as much maintenance as cash crops. "We were a little surprised by how much management the cover crops needed," said Clark. Ideally, the cover crop must be healthy enough to flatten. But if the soil isn't fertile to begin with, the crop won't grow well. 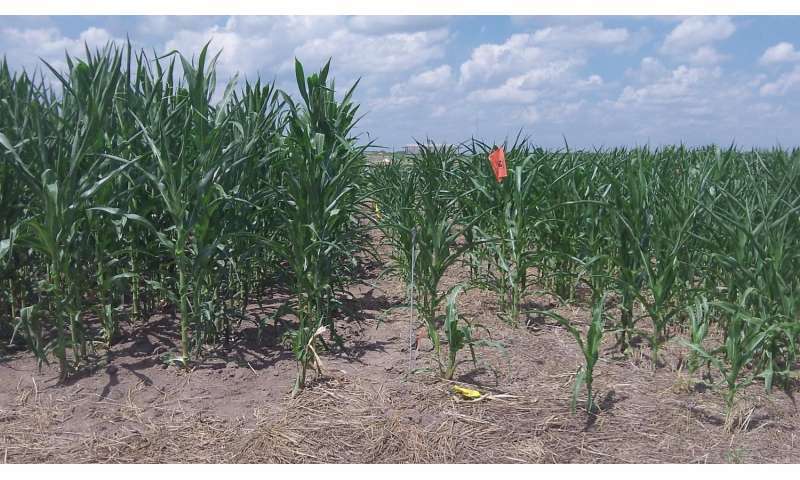 The researchers also found that cover crops work better with soybeans than with corn. When it was time to plant corn, the cover crop hadn't matured enough to become a useful mat. The team had to delay corn planting, sacrificing end-of-season yield. "The timing doesn't match with corn," said Clark. "But it does with soybeans." Cover crops work well to suppress weeds when paired with soybeans, but not as well with corn. The field on right was grown with a cover crop, and researches believe that the cover crop prevented the corn from accessing essential nutrients. Credit: Kerry Clark. Furthermore, soybeans can be planted closely, in large numbers. There will always be enough soybean seed to outcompete cover crops. But corn needs more room to grow, so the seeds are placed further apart. Cover crops can quickly overrun the smaller corn population. "You'd have to double your corn planting to get a decent yield," said Clark. Cover crops also tie up nitrogen when planted with corn, so the team had to add extra manure fertilizer to keep the corn crop healthy. The research team also discovered that the longer a farmer avoids using a disk on a field, the more likely perennial, or yearly, weeds will pop up in the field. They team recommends an occasional turn to break the life cycle of these weeds. Clark said that although she hasn't given up hope for cover crops as a tool against weeds, she's trying other things. Next up? Hot water spray to rupture the weed's cell walls.